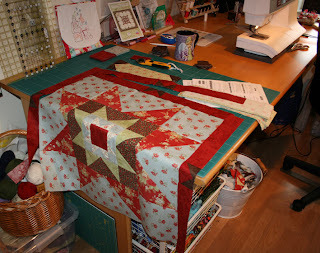 I am inspired by Sinta's BOM Rehab, and finally I dug out the finishing kit for the FQS 2009 designer mystery BOM..... Here you see the star which will be the center of the quilt. The 12 blocks from the BOM will surround this rather large center star. Congratulations! 400 posts is amazing. I really enjoy reading your blog. Spennende å se hvordan BOM'en din vokser fram! I just love the stars. I didn't visite your blog for a long time. Oh boy did you make a lot and all such nice things.